Weighty Matters: My Aquavee swim treadmill review! My Aquavee swim treadmill review! Ever hear of Endless Pools? They're these $5-15,000 pools that you can install or retrofit into your existing pool that allow you to swim against a current. Effectively they allow you to swim endlessly even in your own tiny pool. Ever hear of Aquavee? It's a $79.99 set of bungee cords, suction cups and an inflatable belt that (cost) effectively allows you to swim endlessly even in your own tiny pool. I finally hooked mine up this past weekend (dead simple, took all of 1 minute) and am pleased to say, it's worth every penny. Had a 30 minute swim and my only complaint is some chafing from the belt on my right upper abdomen that I suspect was due to one of the suction cups coming loose and me swimming slightly off centre for the last 10 minutes. Now I'm not a particularly good swimmer (as the video below will attest to), but to my unskilled stroke, it felt pretty much the same as swimming laps in my local community centre. Would be perfect for travelling too as it would turn small hotel pools into endless ones. 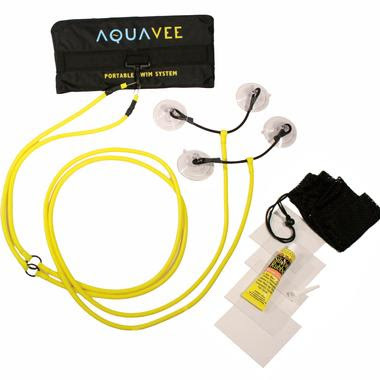 Fabulous product Aquavee - would make a great Father's Day gift. Here's the $79.99 Amazon link - make sure to select the correct size (S, M or L sized belts). Here's a video of me using it in my pool (and yes I know I'm a crappy swimmer). Is your diet deficient in micronutrients? The two questions to ask before you indulge. Mmmm, chip flavoured edible paper frankenfood. How schools can fundraise without junk food.